(Newser) – Sacha Baron Cohen's new show Who Is America? 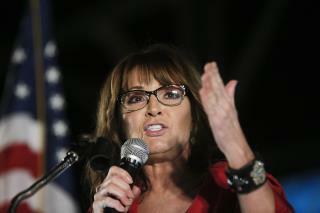 is coming to TV soon—and the British funnyman apparently infuriated Sarah Palin during the filming of it. In a Facebook post Tuesday, the former Alaska governor admitted that she had been "duped" by Baron Cohen, USA Today reports, whose previous characters include clueless Kazakh journalist Borat. In the post, Palin says she and one of her daughters traveled across the US after a request to contribute to a "legit historical documentary," and found that somebody she presumes was Baron Cohen "had heavily disguised himself as a disabled US Veteran, fake wheelchair and all." She says she "sat through a long 'interview' full of Hollywoodism’s disrespect and sarcasm" but ended up removing her mic and walking out. Good thing Track wasn't there. Somebody could've gotten hurt. "Notice how Cohen mocking a disabled veteran is hilarious to the same people who were so offended by Trump mocking a lying backstabber with MS." Sasha Baron Cohen is an actor, a comedian. Crooked Donald Trump is supposed to be a president. Can you see the difference in standards and expectations between the highest office in the land and an actor? If not, then you probably voted for Crooked Donald Trump, international laughingstock.